There is to be no '.' 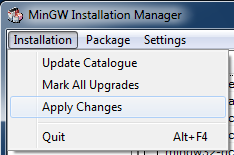 before the 3.
gcc is in the "mingw32-base"
gcc is in the "mingw32-base" package which is supposed to be installed in the 1st part of the tutorial. If you dont' have it, then something went wrong during this phase. Try to reinstall it.